In honor of Father’s Day and great dads of kids with disabilities everywhere, ds-connex is excited to announce the 4th Annual #DownSyndromeDads Contest to recognize and celebrate these amazing fathers! Starting Monday, May 22nd, nominate the fantastic #DownSyndromeDads in your life by sending a photo and brief (one to three sentences), meaningful message about him to ds-connex. Please send your submissions to contests@ds-connex.org. All photos and descriptions will be posted to a 2017 #DownSyndromeDads photo album on the ds-connex Facebook page. All nominators and #DownSyndromeDads are encouraged to promote the contest and ask friends and family members on Facebook to like and share the photo in the 2017 #DownSyndromeDads album they wish to support. The 1st prize winner will receive a $250 donation to their Down syndrome walk team along with a $100 Home Depot gift card. The second prize winner will be awarded a $100 team donation along with a $50 Home Depot gift card. 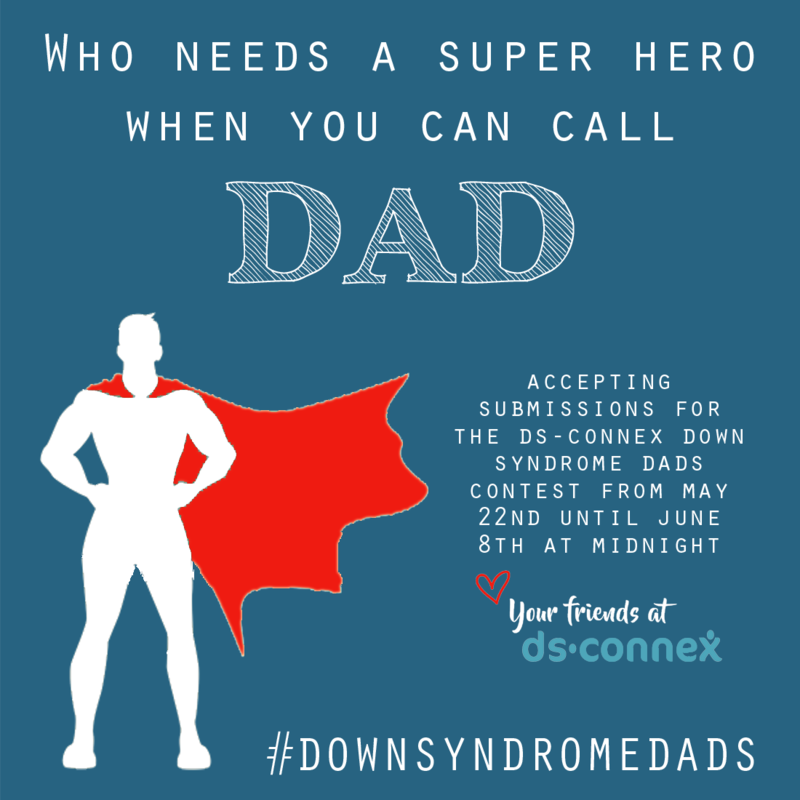 The ds-connex team will collect #DownSyndromeDads nominations from May 22nd until midnight EST on June 8th . The Facebook album will be posted after June 8th, at which time voting will begin. We will notify nominators via email when the album is posted and voting begins, and we will conclude voting on Monday, June 19th at 9:30am EST, when the winners of the contest will be determined. The winners will be chosen based on the total of likes and shares on the photos in the #DownSyndromeDads photo album on the ds-connex Facebook page during the voting period. Please note that in order for your entry to be included in the voting, we must receive your entry by midnight on June 8th. We will happily include entries submitted after 6/8 in the Facebook album, but they will not be eligible for the prizes. Results of the contest will be announced on our Facebook page on Monday, June 19th. We welcome participants in last year’s contest to re-enter with a new photo! 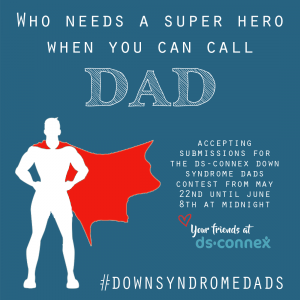 By nominating someone for the #DownSyndromeDads program, you are giving ds-connex permission to edit your submission for grammar and/or length, and to share your submission via the Connexions blog and across multiple social platforms, in order to raise awareness and appreciation of fathers in the Down syndrome community and all they do. The #DownSyndromeDads contest is sponsored by ds-connex.